Fox2 in St. Louis has the tale of David Backes -- former Spring Lake Park and MSU-Mankato standout now playing with the St. Louis Blues -- and how he combined his love of rescuing stray dogs with his love of learning to fly by taking a 700-mile plane trip to Houston to give Emmitt, Lincoln and Ernie a better life. 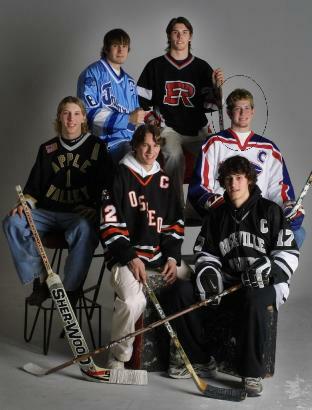 Pictured, by the way, is Backes and other members of the 2002 Star Tribune All-Metro boys' hockey team, which we played a part in selecting. If you can somehow name all six players in that photo without cheating, you are a better person than us. We spent days working to pick the team, and we could only name four of the six kids right now. David Backes has played his entire life in the Spring Lake Park hockey system. As a junior last season he had 75 points. This season, the senior center leads the metro area with 59 points. His skills have earned him a scholarship at Division I Minnesota State, Mankato. Why did he stay at Spring Lake Park? Backes could be playing for a high-profile metro hockey power. Indeed, before his freshman season Backes took a long look at Totino-Grace, currently ranked No. 1 in Class A. Instead, he's with the unranked Class A Panthers, who lost 4-1 to Totino-Grace on Thursday night to fall to 11-11. "It would have been a kick in the teeth to Spring Lake Park for me to go over to Grace," Backes said. "We play them in conference games and in the section tournament. It wouldn't have been right." Or he could be spending his senior season playing junior hockey. On that end, Backes is compromising. He played with Lincoln of the United States Hockey League for 13 games before the high school season - leaving with nine points, the team lead at the time - and will go back when Spring Lake Park's season is over. After playing in front of the big crowds in Lincoln, Backes admits it was tough to come back to the Panthers. But he did. "You wouldn't believe the number of people who've asked me that," said Tom Benson, who has not had another Division I hockey player in 10 years of coaching the Panthers. "Why would he come back to Spring Lake Park instead of playing in front of 5,000 people? I think he just wants to be with his friends." That's an admirable, diminishing sentiment. The most notable parallel in recent memory was mid-1990s high school star Erik Rasmussen, who played for an average St. Louis Park team. Rasmussen went on to play for the Gophers and now plays for the Buffalo Sabres. These days, the best players often cluster together on about 24 top high school teams or leave for junior hockey. That can be a more direct route to a college scholarship. Many times the move is not visible to fans because it occurs after a player's final Bantam A season, before his freshman year. That's when Spring Lake Park lost Tony Ciro, a top goalie throughout his youth career, to Hill-Murray. Ciro is a senior captain for the Pioneers, who are 17-4-1. Spring Lake Park has senior goalie Craig Williams and two freshman goalies on its roster this season. Ciro's departure irked Backes at the time, but he's over it now. He relishes being known as the one who stayed. "I've been on a lot of Triple-A [traveling] teams where guys were thinking about what high school they were going to go to, or going to juniors if they could," Backes said. "There are eight guys here I've played hockey with since we were first-year mites. I have a lot of loyalty to my teammates." His loyalty was not rewarded with instant acclaim. He had 37 points as a sophomore, and there wasn't even a whiff of interest from colleges. Despite scoring 75 points as a junior, Backes did not even receive all-state honorable mention. But MSU, Mankato saw him last year and liked him enough to offer a scholarship before this season, which Backes accepted. Benson, who played at North Dakota with Lincoln coach Steve Johnson, helped get Backes a chance in the USHL. Even at that point, there were skeptics. "Tom told me he thought he had a kid who was a real good player. I saw him play last year at a camp, and I thought he was just OK," Johnson said. " David ended up being a little bit of a surprise. He has a chance, at some point, to make some money playing this game." Backes said he might play in Lincoln again next season to gain more experience before the rigors of the WCHA. Before that, though, he hopes to lead Spring Lake Park to the state tournament for the first time. The Panthers' section includes Totino-Grace, Blake, Benilde-St. Margaret's and Breck - private schools stocked with elite players. Backes, as usual, doesn't mind the thought of an obstacle. "I'm not confident like it's going to be easy," Backes said. "But if things fall into place, we have as much talent as anyone."